'A Moveable Feast': Dining in Venice - Yo! Venice! Stumble across a dining table on wheels roaming around Venice this week? That was Daniel Busby’s kinetic sculpture “A Moveable Feast“! 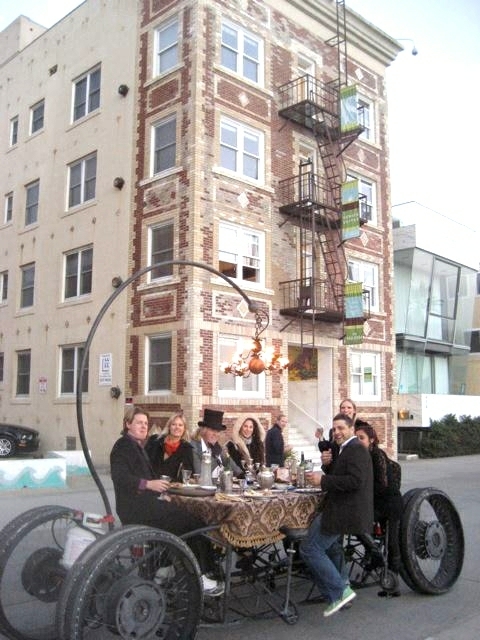 The table was ridden around Venice on Wednesday and Thanksgiving Thursday. The street legal moving dinner table debuted at the 2012 Doo Dah Parade in Pasadena, where it received the coveted Czar’s Trophy. Since then the sculpture has been taken to events such as Mindshare 50, Lightning in a Bottle 2012, Priceless 2012, Burning Man and CicLAvia. Check out the table Facebook page for updates!